"UT/TT Poll: A new president, popular with Texas Republicans" was first published by The Texas Tribune, a nonprofit, nonpartisan media organization that informs Texans — and engages with them — about public policy, politics, government and statewide issues. Putin seems to be benefiting from Trump’s attention and from the American president’s popularity. 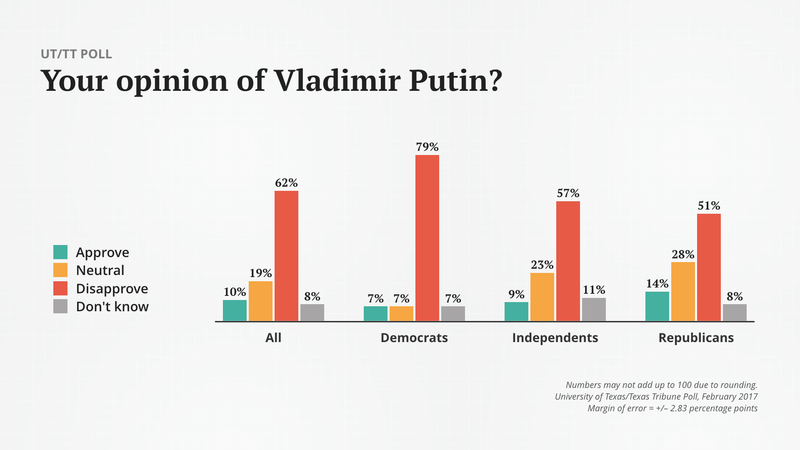 Overall, Putin is clearly unpopular, but while only 10 percent of Texans have a favorable impression of the Russian president and 62 percent have an unfavorable view of him, the disdain is much stronger among Democrats than Republicans. While 79 percent of Democrats have unfavorable opinions of Putin, 51 percent of Republicans do — a 28-percentage-point difference of opinion. Few Texans have favorable opinions of Putin — 7 percent of Democrats and 14 percent of Republicans — but while 14 percent of Democrats had neutral view of the Russian, more than a quarter of Republicans said they had neither positive nor negative opinions of him. “It’s not like they’re loving Putin,” Shaw said. “You’re basically getting 50 percent of Republicans saying, ‘No, the guy is a thug.’ Which means 50 percent are saying he’s not a thug. Texans’ views of Vice President Mike Pence more or less mirror their opinions of Trump: 42 percent view him favorably, 40 percent unfavorably. Among Republicans, 79 percent have favorable views of Pence. Among Democrats, 74 percent have unfavorable views of him. Independents were more negative than positive about the Veep: 29 percent have favorable views, while 44 percent said their opinions were negative. 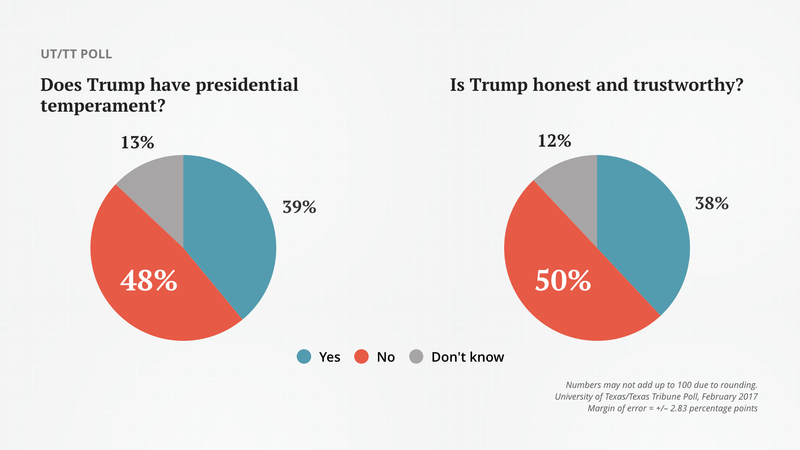 About half of the respondents said Donald Trump does not have the temperament to be president and do not think he is honest and trustworthy. That’s an improvement over what they said in the October 2016 UT/TT Poll, when only a third of Texans said he was honest, trustworthy and had the temperament to be the country’s top elected official. Again, the Republicans and Democrats among the respondents acted as political reciprocals: 68 percent of Republicans think Trump’s got the temperament for the job and 84 percent of Democrats think he does not. Among Republicans, 70 percent said Trump is honest and trustworthy; only 6 percent of Democrats agree. 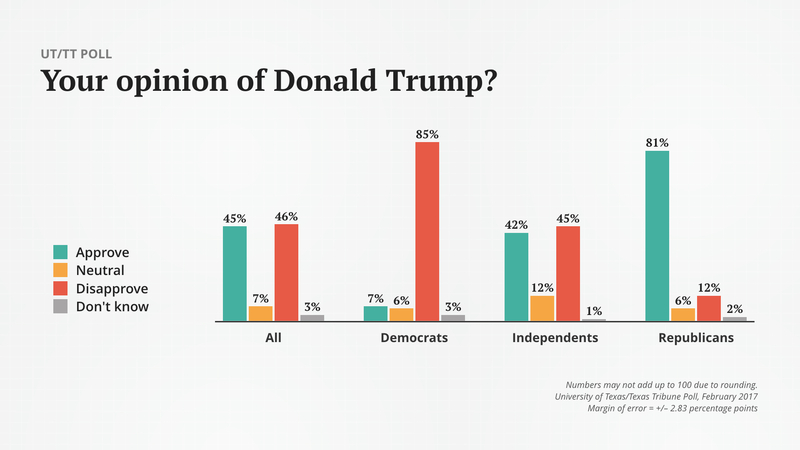 The University of Texas/Texas Tribune internet survey of 1,200 registered voters was conducted from Feb. 3 to Feb. 10 and has an overall margin of error of +/- 2.83 percentage points. Numbers in charts might not add up to 100 percent because of rounding. This is one of several stories on the latest University of Texas/Texas Tribune Poll. Also today: Texans on the economy and the direction of the country and state. Coming Tuesday: Texans’ views on immigration, cultural issues and health care. UT/TT Poll: A new president, popular with Texas Republicans By Ross Ramsey February 20, 2017 In his second month in office, President Donald Trump is getting overwhelmingly good grades on his job performance from the state’s Republicans, according to the latest University of Texas/Texas Tribune Poll. Trump is popular enough to cast positive light on Russian President Vladimir Putin, a world figure who turns out to be markedly more unpopular with Texas Democrats than with Texas Republicans. Overall, 46 percent of Texans approve of the job Trump been doing and 44 percent disapprove. But Republicans are crazy about him: 81 percent approve of Trump’s work so far, and only 10 percent disapprove. Moreover, 60 percent of Republicans said they “strongly” approve; another 21 percent approve “somewhat” of the president. Emily Albracht “He looks good,” said Jim Henson, director of the Texas Politics Project at the University of Texas at Austin and co-director of the poll. “Republicans as a group were tentative in their embrace of Donald Trump during the election campaign. They are hugging him now. His favorability rating among Texas Republicans increased 21 points between October and February.” Likewise, 81 percent of Texas Republicans have a favorable opinion of Trump, while 12 percent have an unfavorable impression of the president. As you might expect, Texas Democrats fiercely disagree in what amounts to an almost equal but opposite reaction to the Republicans: 83 percent of Texas Democrats disapprove of the job Trump has done as president, 76 percent of them “strongly.” And 85 percent of Democrats said they have an unfavorable opinion of the new chief executive. “If you’re a Republican, even if you don’t like the guy, well, there’s the Supreme Court and the repudiation of a bunch of smug ideologues [on the left]; this isn’t the worst thing in the world,” said Daron Shaw, co-director of the poll and a professor at UT-Austin. “The reaction of the left — the resistance — probably reinforces that.” Independents were split almost evenly on both questions in the poll, with 39 percent approving and 36 disapproving of the job Trump is doing; 42 percent saying they have a favorable impression of the president, while 45 percent have an unfavorable one. Overall, 45 percent of Texans have a favorable impression of Trump and 46 percent have an unfavorable one. Emily Albracht Putin seems to be benefiting from Trump’s attention and from the American president’s popularity. “On the surface, the topline number looks like you would expect: Vladimir Putin is not a popular figure with Texans,” Henson said. “But the details testify to the powerful influence of presidential signaling on his partisans. The president of Russia’s negatives are 28 points higher among Democrats than they are among Republicans, full stop.” Overall, Putin is clearly unpopular, but while only 10 percent of Texans have a favorable impression of the Russian president and 62 percent have an unfavorable view of him, the disdain is much stronger among Democrats than Republicans. While 79 percent of Democrats have unfavorable opinions of Putin, 51 percent of Republicans do — a 28-percentage-point difference of opinion. Few Texans have favorable opinions of Putin — 7 percent of Democrats and 14 percent of Republicans — but while 14 percent of Democrats had neutral view of the Russian, more than a quarter of Republicans said they had neither positive nor negative opinions of him. “It’s not like they’re loving Putin,” Shaw said. “You’re basically getting 50 percent of Republicans saying, ‘No, the guy is a thug.’ Which means 50 percent are saying he’s not a thug. “This speaks to the Trump halo effect,” he added. “Putin seems to prefer Trump, and I prefer Trump, therefore Putin can’t be all bad. But the notion that there’s an openness to cozy up to Russia, I don’t think so.” Emily Albracht Texans’ views of Vice President Mike Pence more or less mirror their opinions of Trump: 42 percent view him favorably, 40 percent unfavorably. 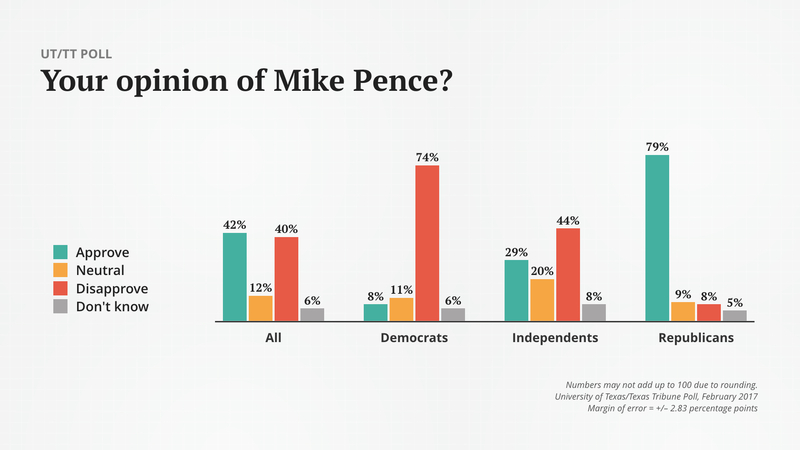 Among Republicans, 79 percent have favorable views of Pence. Among Democrats, 74 percent have unfavorable views of him. Independents were more negative than positive about the Veep: 29 percent have favorable views, while 44 percent said their opinions were negative. About half of the respondents said Donald Trump does not have the temperament to be president and do not think he is honest and trustworthy. That’s an improvement over what they said in the October 2016 UT/TT Poll, when only a third of Texans said he was honest, trustworthy and had the temperament to be the country’s top elected official. “I don’t think that people’s impression of Donald Trump has changed all that much,” Henson said. “But these numbers are a testament to the role of the president as a figurehead and the power of partisanship.” Emily Albracht Again, the Republicans and Democrats among the respondents acted as political reciprocals: 68 percent of Republicans think Trump’s got the temperament for the job and 84 percent of Democrats think he does not. Among Republicans, 70 percent said Trump is honest and trustworthy; only 6 percent of Democrats agree. The University of Texas/Texas Tribune internet survey of 1,200 registered voters was conducted from Feb. 3 to Feb. 10 and has an overall margin of error of +/- 2.83 percentage points. Numbers in charts might not add up to 100 percent because of rounding. This is one of several stories on the latest University of Texas/Texas Tribune Poll. Also today: Texans on the economy and the direction of the country and state. Coming Tuesday: Texans’ views on immigration, cultural issues and health care. Disclosure: The University of Texas at Austin has been a financial supporter of The Texas Tribune. A complete list of Tribune donors and sponsors can be viewed here. Reference UT/TT Poll, February 2017 - Summary (321.8 KB) DOWNLOAD Reference UT/TT Poll, February 2017 - Methodology (52.9 KB) DOWNLOAD Reference UT/TT Poll, February 2017 - Crosstabs (1.2 MB) DOWNLOAD "UT/TT Poll: A new president, popular with Texas Republicans" was first published at by The Texas Tribune, a nonprofit, nonpartisan media organization that informs Texans — and engages with them — about public policy, politics, government and statewide issues. Link back to the original article, which is located at https://www.texastribune.org/2017/02/20/uttt-poll-new-president-popular-texas-republicans/.